Journey To Orthodoxy: "Freedom In Worship" or Is Orthodoxy Charismatic? "Freedom In Worship" or Is Orthodoxy Charismatic? Before becoming Orthodox I spent six years in the Charismatic Episcopal Church (CEC). Much like the predominately convert Antiochian Orthodox Church of which I am now a part, the CEC consisted of Protestant Evangelicals who felt a strong pull back toward the roots of the historic faith. But even though they had dialogues with the Antiochian Orthodox Archdiocese, the founders of the CEC decided not to become Orthodox. Rather, they decided to form their own separate communion so they could have the "freedom" to remain "Charismatic" in doctrine and practice. During my time as a faithful CEC member I visited a Greek Orthodox Church with my CEC priest to hear an Orthodox convert speak. The main thing that intrigued us was the fact that this particular speaker was a former pastor of a Vineyard Church and thus a "Charismatic" as we understood the term. I had a desire to know what would motivate such a man, who believed in the gifts of tongues, healing, prophecy and the like and was involved in the entire Charismatic ethos, to switch to a "dead" liturgical church that didn't believe in the power of God or the "freedom" of the Holy Spirit. My actual question came out more like, "Having been a Charismatic, what part do the gifts of the Spirit play in the Orthodox Church.?" He answered, "I have found that the Orthodox Church is the most charismatic Church on the planet." That one statement was enough to start me on my quest for truth in this area. But he added more fuel when he said, "I finally had to admit to myself that much of what I saw such as "prophecies" in public meetings and to individuals turned out to be false and could not be authenticated." So that was a double whammy. As I researched his two assertions, I found them both to be true. The charisms have always been in the Orthodox Church throughout all of history. Saints were given names like John the Wonder Worker, because of the power of the supernatural gifts that poured through their lives. The monastic orders saw and continue to see the supernatural elements of the faith throughout all of history. 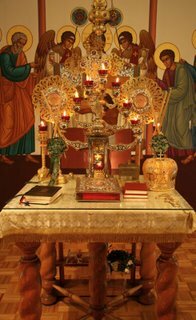 The sacrament of Holy Unction, for the healing of the body by the anointing of Holy Oil, is a normative practice. All of the gifts of the Spirit found in the scriptures are considered Orthodox. But the question is: Are the gifts being demonstrated authentically and are the venues in which they are being demonstrated scriptural or profitable venues? "What scares me is the anti-intellectual, anti-critical-thinking philosophy that has spilled over into the church. This philosophy tends to romanticize the faith, making the local church into an "experience center" . . . Their concept of "church" is that they are spiritual consumers and that the church's job is to meet their needs." From this modern western Charismatic ethos has come the promotion of the individual. They either say they must go to a church where they "feel comfortable" or where they can publicly display their spirituality by demonstrating their spiritual gifts. Public demonstrations have become such a traditional, cultural part of the worship services that unless such demonstrations occur it is determined the Holy Spirit didn't "show up." It is in this unscriptural and unhistorical cultural atmosphere that error is bred and false unaccountable demonstrations occur. Just so you will fully understand my perspective please know that I am considered a prophetic person. (Although I don't claim to be a Prophet). I have given prophetic words by the will of God in public and in private. I have seen angels and have experienced spiritual visions and dreams. I have been a Charismatic musician and worship leader, and have written many worship songs. I have danced in the spirit, spoken in tongues and been "slain in the spirit". I have also served on staff at several non-denominational Charismatic Churches as worship leader and associate pastor. I believe fully the power of the Holy Spirit and the existence of all the gifts that are found in Him. What I have discovered and what I have had to humbly admit is that much of what I saw in the Charismatic Movement was not authentic; in fact much of what I saw and experienced was wrought with deception. Although we should not judge the motive of people's hearts, we have the responsibility to judge the results of that done in the name of Christ. My most shocking epiphany was when I realized that 99.9 % of the so-called miracles, healings, and prophetic words were nothing more than anecdotal fables, wishful thinking, or soulish activity that could not be verified. Not only could they not be verified but in most cases there is no requirement that they be verified. Because so much of the Charismatic manifestations have been proven to be false, a new twist on a scriptural doctrine has had to be embraced. One Charismatic leader states the premise of this new doctrine concerning prophetic words, "In Pentecostal circles, we differentiate between primary revelation, which is the Bible and which we consider infallible, and secondary revelation prophetic utterances that we do not consider infallible." So to them it is okay to give an erroneous "prophetic word" that directly affects the response and lives of individuals with no accountability toward its authenticity. When it comes to the thousands of healing "miracles" that don't take, the doctrine is espoused that either they didn't have enough faith, they need to work to "keep their healing", or they just received a partial healing. An honest student will have to admit that ALL of the scriptural healings were 100% and unquestionable and if a prophet erred in even one point of his message he was deemed a false prophet and was stoned. As a former Evangelical Charismatic, my eyes were really opened when I began to read actual documentation of prophecies and healings that were verifiably false (See www.deceptioninthechurch.com). What was especially shocking was the blatant false doctrines also espoused by the prophets and healers such as, "You don't have God in you. You are a God! ", the belief that God consists of nine parts not three, and the uncanny parallels between the latest manifestations happening in the latest Charismatic revivals and the cults of the eastern gurus (See www.bible.ca/tongues.htm). Without going into a thorough apologetic discourse to these points I will trust the integrity of your search to discover the accuracy of this assessment. One of the paradigm shifts that I experienced, concerns methods of worship and the misconception of how the Early Church worshiped. I assumed and was taught that what we did as modern Charismatics was a model of the early Church. I had the idea that the Early Church met in homes, sat around in circles, and spontaneously (without any agenda) began to sing contemporary songs, say impromptu prayers, give sermons, and quote their favorite scripture as the "Spirit led". Using the list of gifts found in the scriptures, I imagined that at any given time in a corporate gathering, an individual might stand up and deliver a corporate or personal prophecy, a message in tongues, or suggest, "I just feel we need to pray for Miriam right now." It was a given that this might go on for several hours or until the atmosphere ebbed or it was deemed that the Spirit was finished doing "His" work. (I highly recommend that you study the early heresy of Montanism, which parallels much of the Evangelical Charismatic mindset today. Around c. 156 A.D., a so-called prophet named Montanus launched a very charismatic environment, believing that the Holy Spirit spoke directly through him, and his followers. Montanists believed that they were receiving Divine Revelation, like the Old Testament prophets. The concern among the Bishops of the Church was that such emphasis on new prophetic revelation whether corporate or personal might be viewed on the same level as Holy Scripture and could interfere with people's understanding of the core message of the Scriptures and the pragmatic servanthood required to be a grounded Christian. Does this sound familiar?) Make no mistake, there is authentic prophecy. I, myself, have given revelatory personal words of prophetic wisdom to individuals and Church leaders since becoming Orthodox, but not in a public worship service! It is not needed, is not necessary, and is, frankly, not what the worship service is for. The Church embraces all the gifts but not the modern heresy- based method in which it has been promoted. "Never, God forbid, not for anything, not for anyone, should one speak in the sanctuary. Even if one were to have to suffer for it. For the Lord Himself is present there and in fear and trembling all the Cherubim and Seraphim and all the powers of God stand before him. Who then will speak before his face? Even when wiping the dust and sweeping the dirt from the Temple of God, one should not throw it carelessly anywhere. Even the dust of the temple of God is sacred. And the water also to be poured into a special clean place. There is no higher obedience than a church obedience and were it only to wipe the floor of the house of the Lord with a cloth this will be counted higher than any other action by God!" What a drastic contrast to the noisy self-promoting environment of the Evangelical Charismatic ethos where the criteria for spirituality is how well one can prophecy or how "anointed" the music set was! What I discovered through the perusing of history and the writings of the Early Church Fathers was that it is the Orthodox Church that is the model of the early Church worship not the modern Charismatic culture. The early Christians were Jewish. They continued to worship at the synagogue on Saturday and to meet in houses on Sunday, or what came to be known as The Lord's Day. As the Lord's Day meetings continued to develop they continued the structure and order of the synagogue services. It was anything but the free-wheeling "no agenda" atmosphere. Everything was done "decently and in order" as Paul would later state when the Corinthians public usage of some of the spiritual gifts became unbalanced and led to confusion. The work or praise of the people (liturgy) was centered around the Eucharist and all that led up to the partaking of it was designed to tell the whole gospel story. History has provided us with documentation to this effect. In Justin Martyr's First Apology, c. 150 A.D we see the shape of the Liturgical service that the Church has preserved even to today. "And on the day called Sunday, all who live in cities or in the country gather together to one place, and the memoirs of the apostles or the writings of the prophets are read, as long as time permits; then, when the reader has ceased, the president verbally instructs, and exhorts to the imitation of these good things.Then we all rise together and pray, and, as we before said, when our prayer is ended, bread and wine and water are brought, and the president in like manner offers prayers and thanksgivings, according to his ability, and the people assent, saying Amen; and there is a distribution to each, and a participation of that over which thanks have been given, and to those who are absent a portion is sent by the deacons. And they who are well to do, and willing, give what each thinks fit; and what is collected is deposited with the president, who succors the orphans and widows and those who, through sickness or any other cause, are in want, and those who are in bonds and the strangers sojourning among us, and in a word takes care of all who are in need. But Sunday is the day on which we all hold our common assembly, because it is the first day on which God, having wrought a change in the darkness and matter, made the world;and Jesus Christ our Savior on the same day rose from the dead. For He was crucified on the day before that of Saturn (Saturday); and on the day after that of Saturn, which is the day of the Sun, having appeared to His apostles and disciples, He taught them these things, which we have submitted to you also for your consideration." So, does the worship in the Orthodox Church look Charismatic as we have discussed? The answer is "no". But I would not trade one Liturgy for all the Charismatic "freedom" in the world. One of the greatest spiritual moments I have had since becoming Orthodox was during the Liturgy. As we were all singing, suddenly my propensity for individual desires, personal tastes and preferences in worship based on my own cultural passions fell away and I became part of the whole. We were all singing with one voice. Let me say it again: it was as if one person was singing. I didn't lose my own identity and yet it was melded with the others present and the Saints of the ages who were also present just as the Church has maintained for 2000 years. The Charismatic world has many catch-phrases, one of them being "open heaven". You might hear someone say, "We are praying for an open heaven," or, in reference to the newest Charismatic movement, "There is an open heaven over there." 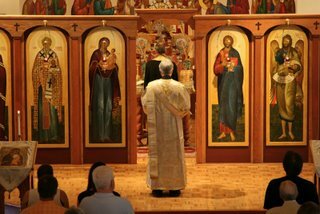 Heaven is truly open every time the Orthodox Liturgy ("work" or "glory" of the people) takes place and we have, not just some ethereal move of the Holy Spirit, but the fullness of the Holy Trinity in our midst and we actually take the Presence of Christ into our bodies by way of the Eucharist. Until now you may have sincerely embraced the Charismatic because it is what you have known and I am sure there has been some value and comfort to you in it. Take heart as you Journey to Orthodoxy. There is room for expressions of worship outside the Liturgy through concerts, CD's and the like. In fact it may encourage you to know, being that our Orthodox Church is located in Nashville, we have as members, several contemporary Christian recording artists who don't feel a lack of freedom at all and whose CD's are available on our own Orthodox Bookstore. We have also had wonderful times of worship in Church fellowships and our annual talent show where different expressions are given freedom. There is also a place and proper time to move within all of the gifts of the Holy Spirit under the umbrella of the "One Holy, Catholic, and Apostolic Church." Just remember, it is the Charismatic culture you have been living in that is the foreign one and not Orthodoxy. 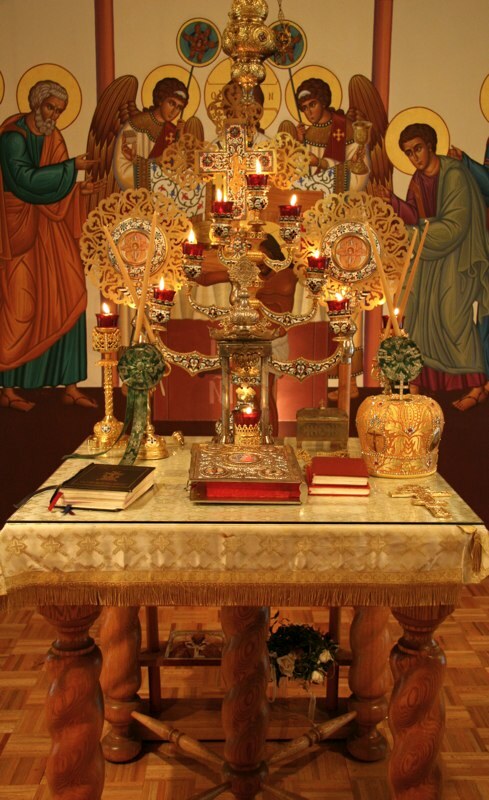 Orthodoxy is meant for you and you are meant for it. My wife and I and our children found this out first hand when we stepped into the Orthodox faith. We knew it was The Faith but also knew that the culture and customs of it might be a shock to our senses. So, we agreed to attend the Liturgy in an Antiochian Orthodox Church for three months before deciding whether or not we "liked" it. I am happy to say, it didn't take that long. The best is yet to come for you in the fullness and the worship of the Church. You are meant to become part of the whole. Don't fear what the Church of the Living Trinity has preserved for all of the body of Christ for hundreds of years. The Holy Trinity is waiting to meet you there as are the myriads of other former Evangelical Charismatics which includes all the saints of the ages who have come before you. May God continue to bless you in your Journey to Orthodoxy. This was sent to me by a dear friend, Mr. (Fr.) Chuck Shores from St. Athanasius Orthodox Church, Santa Barbara, CA. He found it from Touchstone's MereComments Online. The Liturgy and Holy Tradition are the "scanty plot of ground" where spiritual sanity is preserved for us Charismatics! Well good for you! So glad you've found yet another true way to worship. So long as you don't expect everyone else on the planet to bow in sync with your bow, more power to you. Not everyone is willing to give up the way they worship, the way that's right for them, because it's not right to you. Your truth is not everyones truth, and with so much left before you're fully integrated into the orthodox faith can you truly be giving advice, and telling people in such an open forum that this is the right, the truth, and the only way to go. Lets just say this has been hashed and rehashed in your lifetime and its to your discredidation. Blessings on you "Anonymous". You make some very sincere points and worthy of response. Journey To Orthodoxy has devoted an entire article to your Comment. Please see "Drive By Bloggers or DDBs". Wow! This really blessed me. I'll share it to my fellow friends. It was the first time for me to experience this freedom in woship and spontaneous-ity ..i had many propetic words and recieved many. I thought i heard the voice of God and the calling He has for me the plan He has for my life. We have counterfiets here in Egypt ,many of them belong to this NAR doctrine. And since ,there is not much background of all the pentacoism and protestantism diversity in here-Egypt has been always orthodox till some missionaries came here-there s not much up to date knowledge of the heresies and bad doctrine that continue to pop up on a daily basis in pentacolism and charismatic meetings! Its good to know we have companions and travellers on the same journey as I am.. I still have many disappointents and questions especially in losing that Passion i once had as an enthusiastic believer that used to worship the Lord in these meetings. Nardeen Adel, No matter where you are the desire of the enemy is to keep you from the empowerment of the Holy Spirit. It is actual. It is tangible. It is effectual. Our mission is Saint Symeon The New Theologian. Read his works and whenever someone tells you are in prelest or deceived, ask them if they believe that about him...or Saint John of Kronstadt. There is a false idea that somehow God's good gifts are reserved for the clergy and laymen or laywomen are lesser! I love the Coptic People and have been inspired in your fervency. Stay the course and let's keep communication open. I have much to learn.